Our Thursday brings us to a launch Nintendo 3DS game. The games offered to those who jumped onto the Nintendo 3DS bandwagon at launch weren't great in quantity, and many weren't that great in quality either. One such game is Super Monkey Ball 3D. Having had such great memories of the GameCube entries, and even the Game Boy Advance Super Monkey Ball, seeing the sharp decrease in quality since the series' inception makes us sad pandas... well, sad monkeys, to fit with this review. Oh, Super Monkey Ball series... I remember a time when this series was one of my favorites and was synonymous with awesome arcade action. Unfortunately, that time simply spanned two games, the first two titles in the series, and they both are over a decade old. With the release of Super Monkey Ball Adventure, a game I'm sure many Monkey Ball fans have subconsciously blocked from their collective memory (sorry for bringing it to the front of your minds now! ), the slow, steady, and sad decline of the series began and never really stopped. 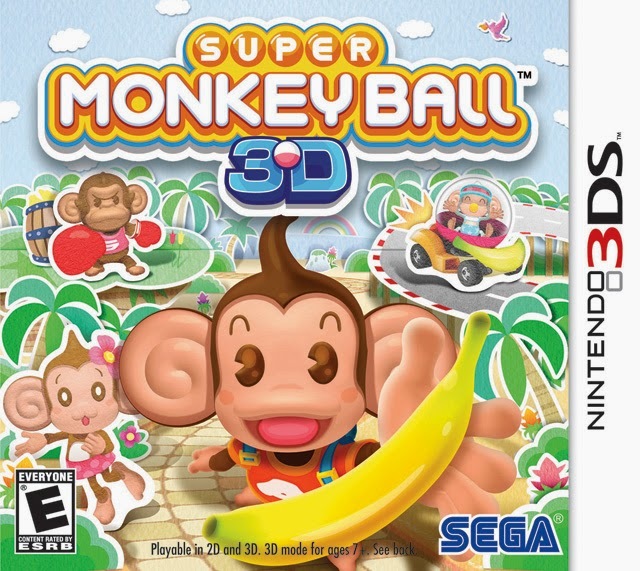 Does Super Monkey Ball 3D, the Nintendo 3DS launch title, buck that trend? Well, let me save you the suspense-- no, it doesn't. 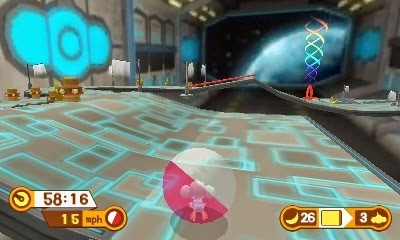 The main monkey mayhem to Super Monkey Ball 3D takes place in the traditional ball-rolling levels, which simply task you with racing to the goal without falling off the stage or running out of time. Bananas are sprinkled through each level, with the purpose of collecting 30 for an extra life. They also serve as a collectible, as acquiring every banana in a given world, of which there are eight that feature ten levels each, you get a special medal that is placed in the world selection menu. you to a better game, Aiai. 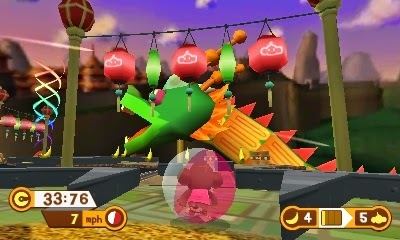 The stage design is what makes or breaks a game like Super Monkey Ball, and unfortunately for this 3DS incarnation, it ultimately breaks this game. 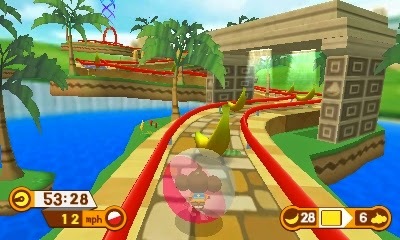 It's clear that Super Monkey Ball 3D was designed for the system's built-in motion sensor/gyroscope controls. This means the resulting levels created to complement this novelty are absurdly simple. With the game's Circle Pad controls (i.e. the way you'll actually want to play the game with), the flawed level design is only further magnified. The majority of stages in Super Monkey Ball 3D are either insultingly easy or designed so poorly with haphazard and obnoxious obstacle placement that they simply aren't much fun. While there are moments of greatness in the stage design, these moments come way too few and far in-between. The difficulty, however, does pick up a little near the end, namely the last world, but it's overall a heavily lackluster experience. their own senses of personality. 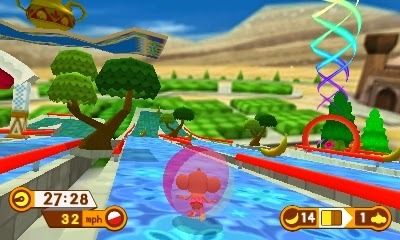 The Super Monkey Ball series is known for having an abundance of party mini-games for local multiplayer sessions that last all the way into the wee hours of the night into dawn. Unfortunately, gone are actual engaging mini-games such as Monkey Target, for instance, and instead they are replaced by a total of two mini-games. The first is Monkey Race, which is a fantastic kart racer if you're a fan of bashing your head into a wall until blood starts oozing out of your forehead. Forgive my wordplay trickery there, but with incredibly bewildering control decisions that make absolutely no sense (unless, of course, you have bashed your head into a wall repeatedly like the designers must have done), Monkey Race is a failure of a kart racer that simply takes up room on the game card that an actually entertaining mode like Monkey Target could have been included, then. scalding hot fire on my monkey, Mr. Dragon. Monkey Fight is the other game included, and this is purely a Super Smash Bros. ripoff. The only thing here is that it's not even a good or pleasant one. The controls respond as well as a blind monkey following sign language (had to throw some monkey-related metaphor in there somewhere to fit with this review), and the combat as a whole is clunky at best. The flaws of Super Monkey Ball 3D don't end with the gameplay and modes either. No, the visuals are severely lackluster, even for a launch Nintendo 3DS game. The 3D effect is hindered by a HUD that doesn't pop out like it should; it actually appears far in the distance while the environments and stages up-close, making a severely jarring visual experience. Usually featuring memorable music, Super Monkey Ball 3D bucks that trend, too, offering highly forgettable but passable all the same music. This is child endangerment here. He's just a baby for crying out loud! Super Monkey Ball 3D is a game you should definitely not monkey around with. Its stage design most likely is insulting to all except the youngest of gamers. The added multiplayer modes do not actually add much of anything, except poor gameplay and even worse controls. Not only all of that, but like Resident Evil: The Mercenaries 3D, there is no way to delete your data from the game card. That means if you buy this game used, you'll have as much content completed and stages available to you as the game's last owner(s). ...Well, at least the main game is quite playable, right?